I can’t believe I’m saying this, but thank goodness summer is almost over. It’s been raining non-stop and I’ve been eating so much delicious food that I need a big winter sweater to bundle up in ASAP. I’m not sure what it is about this time of year but I’ve been lining up a few little foodie adventures I wanted to share with you. Perhaps it will inspire you to discover something tasty in Sydney. I finally tried Longrain in Surry Hills. This has been a restaurant on my list since moving to Sydney. It had been recommended by a friend who used to live here. I think I probably built it up too much in my mind. We had a really nice dinner here, but it didn’t “wow” me like I wanted it too. That being said, I do want to go back with a big group and try more dishes. I think it’s a place that you need to try several of the dinners. For dessert I had yummiest black sticky rice with coconut cream and mango. Next new Surry Hills spot to check out will be Watts on Crown. My brunch partner in crime Trish spotted it. 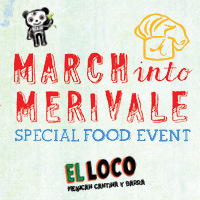 Later this month we are going to an event at El Loco called “Vinos y Tacos” – it’s part of March into Merivale. This is a month-long series that Merivale (they have 12 restaurants and 25+ bars) put on each year. They have classes and dinner specials listed on their website. I also somehow got talked into going to a crazy Game of Thrones feast at GastroPark. It’s a medieval dinner to celebrate the DVD release of this HBO series. I’ve never seen it, but apparently it’s pretty entertaining. I was just sold on the idea of going to an awesome medieval feast. I’ll have to watch a few of the shows before I go. I’ve been geeking out a lot about the food trucks coming to Sydney. Major squeeee! This map with the truck locations on Google Maps was being shared on Twitter over the weekend. Here is some information on the 10 Trucks and a video from the City of Sydney with some more information. It all seems really thought out and structured so I hope they do well. I am definitely organising a “food truck crawl” later this year. To top it all off, this month is also “Parched March” where Sydney-siders are encouraged to drink at 30 new bars. Yes, this is a real thing, and yes, it also has a charity component so you can’t hate on it. There are participating bars offering drinks specials and the website has plenty of information about the event and the cause. While I won’t formally be participating in the campaign – I like to think that I’m an unofficial Parched March (and year-long) participant and supporter of Sydney small bars. What other foodie adventures can we go on?